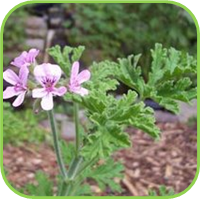 A fast growing plant with highly rose scented leaves bearing small mauve flowers in summer. 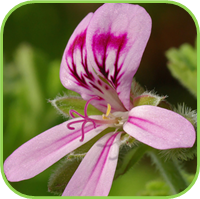 The Geranium is also well known for a variety of smells such as, rose, mint, coconut, citrus and nutmeg. Perennial. H: 80 cm W: spread 80cm. 12cm, 17cm. • Perennial, Evergreen, Frost tolerant. • Highly rose scented leaves. • Small mauve flowers in summer. • Sorbet, Punch, Summer drinks. • Use a strong infusion to flavour sauces, custards, jellies, buns, water ices. • Herb butter for cakes and sweet biscuits, spread on bread and scones. • Add flowers to salads, use as garnish,. • Use in potpourri and pillows for a relaxing and soothing lemon-rose fragrance. • Add to bathwater, Bath Smoothie. 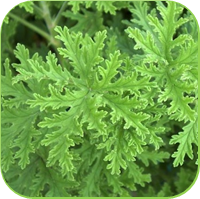 • Infuse as a mild astringent to clean and help circulation of pale, sluggish complexion. • Drink up to 3 cups per day.